The Zoetermeer based adhesive and sealant manufacturer has again come up with an innovation for Domotex 2019. The company, which had great success at last year's edition with the MS FLOOR Booster, will this year be presenting its successor, the revolutionary MS 2K. The MS 2K is a specially developed, environmentally-friendly, 2-component parquet adhesive that can be fully loaded after only 2 hours. The unique formula ensures that the adhesive is twice as strong, prevents sweating and is also suitable for compensating height differences between the wood and the subfloor by up to 100%. 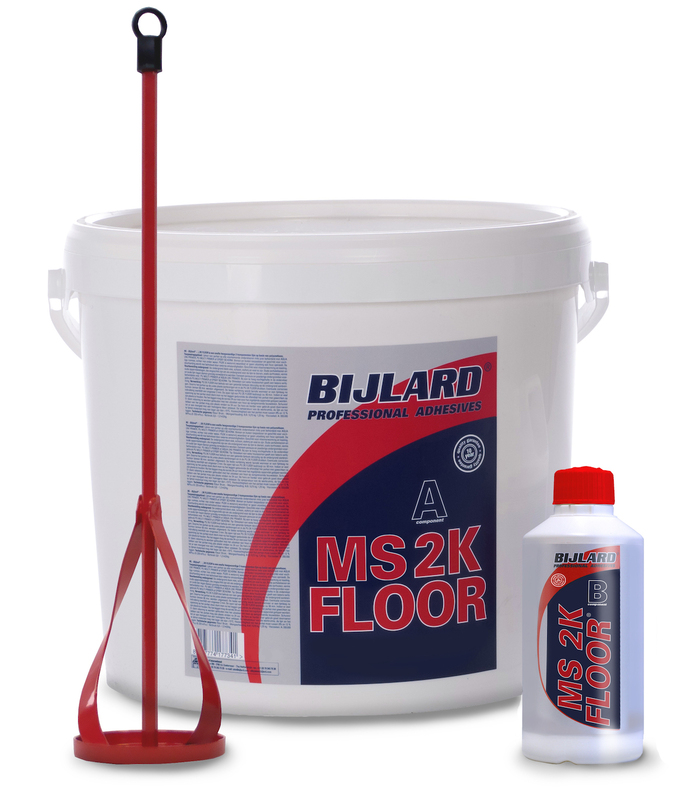 The MS 2K FLOOR consists of a 9.75 kg bucket of MS-FLOOR parquet adhesive and a 250 ml dosing bottle of MS FLOOR Booster. Following market research, the company decided to meet the wishes of the market by making the packaging slightly smaller (total 10 kg). This packaging unit is precisely tailored and this means that all the adhesives can be used within the processing time and it ensures virtually empty buckets: no material wastage and therefore very sustainable. Bijlard International can fully guarantee the parquet installer that the MS 2K FLOOR is free of solvents and isocyanates and sees this new product as an excellent alternative to 2-component polyurethane adhesives. This innovation is in line with the manufacturer`s goal of providing very strong and clean adhesives that reduce environmental impact and do not endanger the parquet installer`s health. We look forward to welcoming you in Hanover at our stand D011, in hall 13. Of course, you can always contact your account manager for more information.